Guess quick! Which San Clemente High School team has earned four National Championships in the last four years? Surfing, you say? Not even close. Beginning in 2004, the SCHS Dance Team, under the direction of coach/choreographer Kelly Devine, has brought home four trophies, including two last year in the Large and Small Hip-Hop category. The girls have their sites set on March 7 and 8 at the Anaheim Convention Center, where they plan on once again defending their championship. “During this competition season, we’ve spent hours working on and cleaning dances to make them “competition” ready. It takes a lot of work, but it is so worth it when all that hard work pays off and we win in competition and nationals,” stated Competition Captain, Kelsey Hutcheson. The long journey towards this year’s competition began last June when, after a week of tryouts, the team was selected. This year the girls are lead by the team’s only senior, Team Captain Whitney Ayer, along with Hutcheson, a junior. Other juniors include Chanel Cook, Kelli DeAngelis, Tiana Joncich, Allie Roy, and Devon Rys, who join returning sophomores Erika Brittain, Janaye Jung, Alexa Montoya, and Jennifer Stiefel. Newcomers include juniors Danielle Luna and Amalia Porcel, sophomores Chloe Cruse and Gabrielle LaCarre, and freshmen Megan Conlon, Salina Forrest, and Natalie Spaeth. After their selection and two months of attending individual and group summer classes held both in the dance room at San Clemente High as well as many local studios, the team came together in mid-August for “boot camp.” During this two-week, eight hour a day schedule, the girls were introduced to a multitude of dances that they would be performing throughout the year choreographed by Devine, as well as guest choreographer Tim Stevenson and assistant coach Kaylee McPhee. During the fall semester, the team performed at various school functions, pep rallies and half-time shows, including Homecoming. They also appeared at a number of community events, including San Clemente’s Character Counts Jamboree at Truman Benedict Elementary School, as well as the Walk for Hunger and the Red Ribbon Parade held on Avenida Del Mar. “We feel that not only do the girls represent our school on the stage, but off as well. We want the girls to be well-rounded individuals who maintain solid grade point averages, develop leadership skills, and give back to our community for all the support they receive,” added Devine. 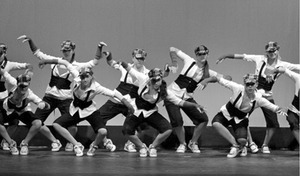 The highlight performance of the Fall Semester was the Winter Dance Concert in December, entitled “Dance Dance Evolution.” This year’s program, featured not only the defending National Champion Dance Team, but over 150 student dancers, including the Mezcla Latina Club, and the all boys Purple City Stars hip hop club. “All the groups worked very hard and I was excited with the variety of the dances we have to showcase as well as the number of dancers involved in this year’s program. It had a little something for everybody,” stated faculty advisor Kelley Holt. January 14 found the girls hosting their annual Dance Clinic, “Dancing with the Stars,” where elementary and middle school girls and boys came to the Triton Center on campus to have fun and learn some moves from the team. The day started off with warm ups, then the camp broke into different age groups where dance team members chose their own music and designed their own choreography for their campers. All the groups reconvened for a pizza lunch, then performed their new dances on stage before their friends and family members. “This is a great time for our girls to move from being dancers to teachers. It gives them a chance to practice leadership skills by planning and conducting a dance lesson, then working both with small groups and individual kids,” stated Devine. Obviously, it has been a varied and fun year so far, but now the time approaches when the team struts its stuff on a national stage. This year, the team will be bringing five or six dances from their Winter Concert to Nationals in March, depending on how well they are received at the qualifying competitions, continuing Saturday, February 9, at Aliso Niguel High School. The dances selected for competition this year include: “Hallelujah” (featuring Joncich, Montoya, and Rys), and “We Takin’ Over” (Large Hip Hop), both of which won first place at the Kids Artistic Review in Lakewood, along with “Escape” (Small Dance), “Hiding Under Water”(Large Lyrical), “In the Navy”(Character or Novelty), and “1/2 Time Show”(Small Hip Hop). Devine is confident that this team will once again have a major impact on the competition. “Although we’re young, the girls are extremely hard-working and committed to the program. With a smaller team this year, we can pay more attention to detail in each dance. Also, ever since summer camp, this team has bonded together extremely well. The competition will be intense but should also be a lot of fun for the girls,” stated Devine. A great help this year has been a new “sprung floor” installed by members of the Encore Club (dance team boosters) over the Thanksgiving Holiday. “With all the hours we are putting into rehearsal, having a floor with a little give [versus the previous wood-on-concrete version] allows the girls to have crisper leaps and turns, but more importantly, saves them from the accumulated wear and tear that can sometimes lead to injury. We are very fortunate to have such a nice facility for our practices,” added Devine.